Though Caroline has experienced a great deal of success during her time in the industry, it’s not that measure that defines her. Her involvement in the community, more than anything else, has helped grow her business and provided a great amount of personal satisfaction. As a local mom, she’s involved in the PTA, was an officer for the Maplewood Rotary Club, and to this day, still volunteers at fundraisers and other local events. She co-founded a local chapter of the national women’s group, B.I.G. (Believe. Inspire. Grow), in order to give back to other female entrepreneurs and also partners with Giveback Homes by donating a portion of the proceeds from every closing to build a home for a family in places in need around the world. Caroline’s sights remains firmly fixed on continuing the growth and development of her current team, as well as expansion. During her free time, Caroline loves being a mom to her 9-year-old son. She loves to travel and speaks three languages: English, French, and Spanish. She also enjoys cooking, reading, and can often be found hiking with her rescue dog, Toutoune, in the South Mountain Reservation, a large 2,000plus acre area of protected land in Maplewood’s backyard. 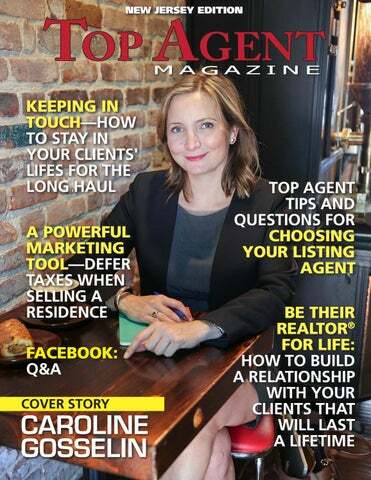 To learn more about Caroline Gosselin, visit gosselinhomes.com, email caroline@gosselinhomes.com, or call 973-985-6117 www. you can’t just get back to a lead three days later. The consumer today expects to get a reply quickly. I’m constantly amazed when someone thanks me for responding quickly about a product or a question about our coaching. Our standard for answering product and coaching inquiries is within the day. What’s your standard for answering lead inquiries? (Which require much faster responses, in my opinion, than my ‘leads’). turn that lead into an appointment. In my coaching program, Carla Cross Coaching, we find that developing agents lack the sales skills to optimize their time and energies. So, we The Second Principle: Give provide sales skills training resources to shore up their motivation and desire the Lead Its Value to reach their goals. If you’ve ever spent time generating your own leads, you know what this Set Your Sites And Raise Your means. As a new agent, I knew Skills To Mastery about two people in the area. Because I had no built-in network, I Our high accountability training did every kind of lead generation program, Advantage, is helping new known to man. 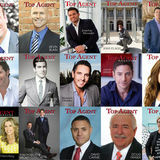 I worked all the and newer agents capture the sales time. I learned by all my mistakes and organizational skills it takes to how to generate leads—and the convert leads more often. But, value of a lead. Purchasing a lead is training is only the start. It takes so much easier than generating your coaching to master any skill, along own. But, you must treat that lead with your determination to get like the potential gold it is, so you’ll really good at lead conversion. be the Jerry of sales, not the George. Decide today your standards for performance, what you want to The Third Principle: Develop master, and how you’ll go about it. Now, you’re on your way to Your Sales Skills becoming a top producer! Following up on the lead immediately shows you value the lead. But, that’s Copyright©, Carla Cross. All rights not all. It takes specific sales skills to reserved. demonstrating that those who put technology to work effectively today capture the consumer’s attention and loyalty.